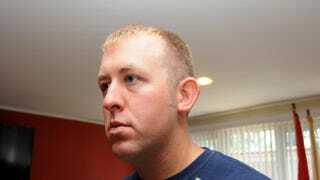 Darren Wilson is seen in an undated handout photo provided by the St. Louis County prosecutor’s office. Over the weekend Darren Wilson, the Ferguson Missouri police officer who wasn't indicted for fatally shooting unarmed teen Michael Brown, resigned from the police force, and the Ferguson mayor says that this ends the relationship between the city and Wilson. According to the Associated Press, Wilson, who had been on paid administrative leave since the Aug. 9 shooting of Brown, will not receive benefits or any further pay because his resignation was effective immediately, Mayor James Knowles told reporters. The news that Wilson would not be receiving additional income from that St. Louis suburb comes on the heels of speculation that Wilson has a $1 million "war chest" from online fundraisers held by supporters. Wilson's lawyer, Neil Bruntrager, told AP that Wilson decided to resign after Ferguson Police Chief Tom Jackson informed of him of death threats he had received Saturday. "Continued employment may put the residents and police officers of the city of Ferguson at risk, which is a circumstance I cannot allow," Wilson wrote in his resignation letter, viewed by AP.